Today, organizations of all sizes are investigating cloud computing and the benefits it can bring to their company. Given the numerous claims of savings and productivity improvements, it can become difficult to understand exactly how these benefits might apply to your particular IT environment. The representations of savings in this guide are based on a 2009 Cloud Computing ROI study conducted by IBM Research. The study uses customer environment data and cost saving data from more than one dozen companies working with IBM on Cloud Computing. Input was taken directly from IBM clients as well as from IBM strategic outsourcing teams that manage these custoer's environments. 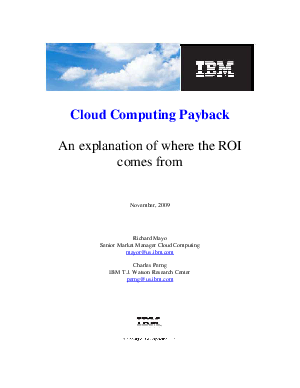 The results overview the financial benefits of implementing cloud computing and provide quantitative analysis of the payback.